Have you ever daydreamed about your own imaginary country? Those of us at Meraki Games have or else we wouldn’t be in the business we’re in! What kind of terrain would each country have, who would live there, what kind of government would rule? We had to answer these questions plus many more we’d never before imagined in the creation of our world of Zevestok for Pyrrhic Victory. We knew what kind of game PV would be but before we could start the artwork or programming we had to develop all the details of the world. Kyle tasked each of us on the writing team to create two of our own countries. We had to think of the physical aspects like geography and climate. Next, we explored the people and their culture. We met numerous times over the last several months to reveal and discuss our new countries with each other as well as to fill the many holes. Finally, we had to come up with names for everything. That was probably the hardest task of them all! We used a bit of experience with our own countries, to start, in helping to decide what the world would look like. Take Rupani for example. This was one my babies. I live in south-central United States so using that as an example was easy. Rupani is a diverse landmass ranging from deadly swamps to highly fertile plains, and finally, north to the colder territory of Ngahn Laahng. The mountains of Yao Feng Divide on the Eastern border of the country closely resemble the Rockies but with an Alps flair. This basically means they’re roughly the same altitude as the Rockies but match the Alps when it comes to the huge amounts of ice and snow. One of the biggest questions was, obviously, what kind of people would live in each country? I imagined Rupani housing a small but sturdy and fierce race of people who respect their ancestors so much it’s as if they never died. As the running pattern here, and following the typical advice of start with what you know, I decided that each citizen would serve mandatory military service for a time. There is a bit of a twist though. When I say each citizen I mean both men and women. When it comes to government the idea of a king and queen with a democratic election process is fascinating. Granted, King would be title only whether a man or woman is elected. Yes, that means his or her spouse would be called Queen. Once we decided on the basics of each country the Writing Team met each week for many, many months to discuss them with each other. The main reason was to hash out any missing details or fill holes that the country creator couldn’t see. And there were so many holes, which is why it took so many months to finalize the world! It did get frustrating at times, but I can honestly say that I’m proud of what we’ve accomplished through that hard work and look forward to releasing more World Tours with our trusty guide Tsai Shan, though his expertise may not be as profound in Slahor or Wajanderu. We shall soon see. As you may have noticed most of our names for Rupani have a Cantonese background. Ahn Wuh, for example, translates to Eye Lake. Granted this may not be grammatically correct, for those of you who actually speak the language, but we took a bit of artistic license there. The same goes with Beih’go Bao. It indirectly translates to Nose Fort because, well, that peninsula looks a little like a nose. We had a bit of fun with that one. That is basically the theme throughout our naming process. Each country has a base language we modelled their speech after. We used English to name everything and artistically translated into our choice dialect. Not only did we have fun naming things, but it also helped us learn a few words here and there in different languages. When we first started creating Zevestok I thought it would be the easiest part of creating Pyrrhic Victory. Was I wrong or what! 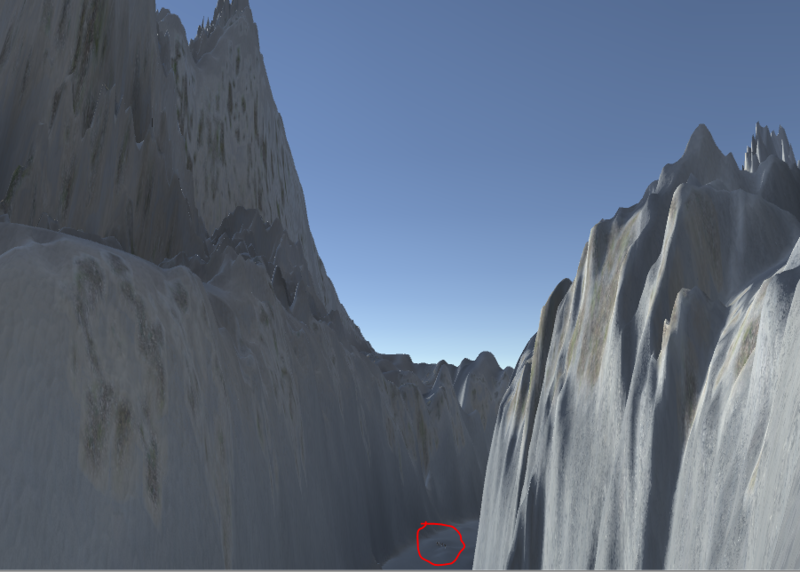 It has been the lengthiest part of the game development to date, but the details of what we’ve created is fairly epic. I hope everyone enjoyed the first Chapter of Fire Dance! Fire Dance, and the short stories to come are meant to give you backstory on the nations in the game and many of the main characters. It is a harsh world out there, especially for mages – keeping alive is difficult when the 5 major nations are often at war with one another. Of course, since most nations have assassins, magic and highly trained soldiers, allying yourself with one of the nations will usually keep you alive a little bit longer. As O’in found out, even blood ties can’t keep you alive in Slahor if you wield fire magic, but there are some in the world that do appreciate the good that fire magic can do (or at least, how destructive it can be against your foes). If you haven’t read Fire Dance yet, be sure to check it out here. We’ll be posting up the second chapter of Fire Dance in a couple of weeks where we will be introducing more of Wajanderu and follow O’in as he meets other mages and other people – people that aren’t trying to kill him for once. Since O’in will be heading to Wajanderu soon, I wanted to show you all some actual in-game screenshots of Wajanderu. Bear in mind that the maps are subject to change, not to mention they might not fit precisely into the game by the time we release. First up is a small travelling trail through the large forest Herwald near Blauflus. Blauflus is the Wajanderu city which floats on a river on the eastern side of Mount Xue’feng. 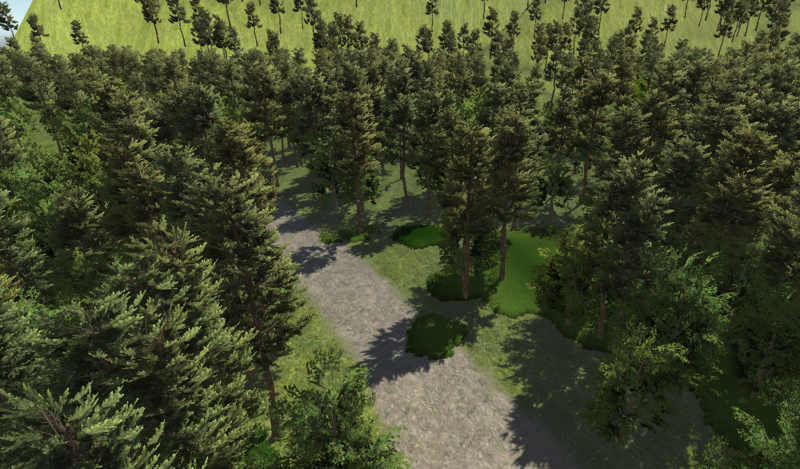 The Herwald surrounds Blauflus, from north to south and provides protection for Blauflus – enemies that attack are often beset by Wajans in the trees (at least until they burn down the trees). This particular portion of the Herwald is used by merchants travelling to and from Slahor and Kosekya (a nation we’ll see later). A mountain pass through part of Mount Xue’feng, kept safe by the magics of three nations. Do you see the tiny black dots inside of the red circle? That is a hint to the size of Mount Xue’feng and the scale of the task that the three nations have undertaken to shift this tiny part of it without getting anyone killed (usually). This is also the scale of game we’re looking to make, large maps with plenty of room to plan strategy and tactics with large (or small) armies. Perhaps in a defense having people climb high up on the mountain to drop rocks on the enemy’s head could prove to turn the tide in a defensive battle – it would be impossible for them to fight back if the enemy is far out of arrow reach. 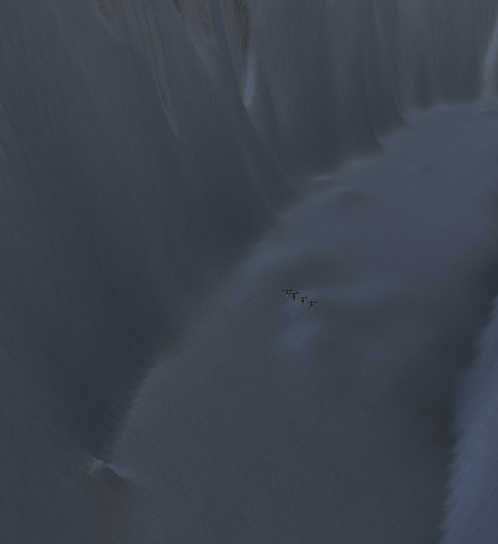 This is the size of the actual soldiers in the mountain pass. Yes, this is the proper size of the soldiers. Mount Xue’feng is just really big. Well, that’s it for this week – have feedback or questions? Comment here, or on facebook/twitter! If you like Pyrrhic Victory, help spread the word please with one (or more!) of the buttons below! If you found the tidbits of world lore interesting, we have Nation pages up for Wujanderu and Rupani, and we’ll be adding one for Slahor soon! Well, what a year! I can certainly see the appeal in working on games full time as many of our fellow indie devs do – between familial illnesses and injuries, moving houses and other life-happens events sometimes it can be hard for a 100% part time team to find the time to update our amazing fans and work on the game and all the overall administratum that flows along with it. Really, where did the last year disappear to – even the snow seems to have expected winter to be another month or two from now! So, as the boss of Meraki Games – I am sincerely sorry for not posting anything for you all over the last year; we’ll be posting more this year since we’ve already finished up a backlog of items that we want to post. As always, feel free to send us a hello if you’re wondering how things are coming along! Our budget has about doubled which will allow us to hire on some additional help – especially for music and artwork. We’re looking forward to using the budget to make Exile Saga even better! As for Exile Saga overall – we’ve actually backtracked. We decided a few months ago that the retro look just wasn’t working for us. After analyzing the costs, it is actually more expensive for us to create good 2d pixel art for our characters than it is to create 3d models. We were often fighting with our engine in order to get it to do exactly what we wanted. Mark had gained a lot of proficiency, but it still takes longer than we’d like to set up areas and battles and they just weren’t where we wanted them to be. Rather than continue to fight with it, we’ve decided to move to Unity 3d which already has many of the major pieces in place and will allow us to make a beautiful game which we can be proud of and players will love. So far we’ve had great success with it and we’ll be showing some of the shiny new system in 3 weeks. Exile Saga will continue to focus heavily on story with an Active Time Battle system – it’ll just look nicer, play better and be a lot more fun. After long discussion and deliberation, we’ve decided to work on a second game at the same time. Primarily we’ve chosen to do this as it is often very difficult to maintain communication over large time zone differences when we’re working part time – often a couple team members are still at work while the others are working on the game. There is also the matter of length – Exile Saga is a massively long game which will take a long while to complete, our new game is shorter and will be completed significantly quicker. This will also give us more to show you, our amazing fans, as we’ll have two games worth of changes to show per month which means we should be able to maintain a weekly release schedule by alternating games – every Sunday that you come by, we should have something new and shiny, some lore tidbit, an epic tale from our writing team, or even just some tips on game design or writing to show you. Most importantly, since both games are 3d, we’ll be able to use knowledge and assets from one game in the other. Thus it is with great pleasure that I present Pyrrhic Victory, a standalone 3d multiplayer medieval warfare simulator. Pyrrhic Victory is inspired by epic tales from throughout history – be it the legendary Battle of Troy, the Battle of Stirling Bridge in Scotland, or the battle at Heraclea during the Pyrrhic War where the game derives its namesake. There will be opportunities to play with friends and family in large scale battles – fight together or apart and conquer your enemies. Players will be able to take control of the army as the commander and oversee the strategy and tactics, or they can lead a handful of soldiers as they charge headlong into the enemy ranks (or flanks). Of course, we have also developed a large world for Pyrrhic Victory to take place in – with six unique races and 20 odd mercenary factions every battle will be a struggle to the last. You can find more information on the Pyrrhic Victory page above. Next week we’ll be posting the new story: Fire Dance, a short story about what it means to be a Remedon Za’Abat in the Slahor society. Well, that is all for this week – check back here on January 10th for Fire Dance, and Jan 18th for the final conclusion of Lamenting Tree! 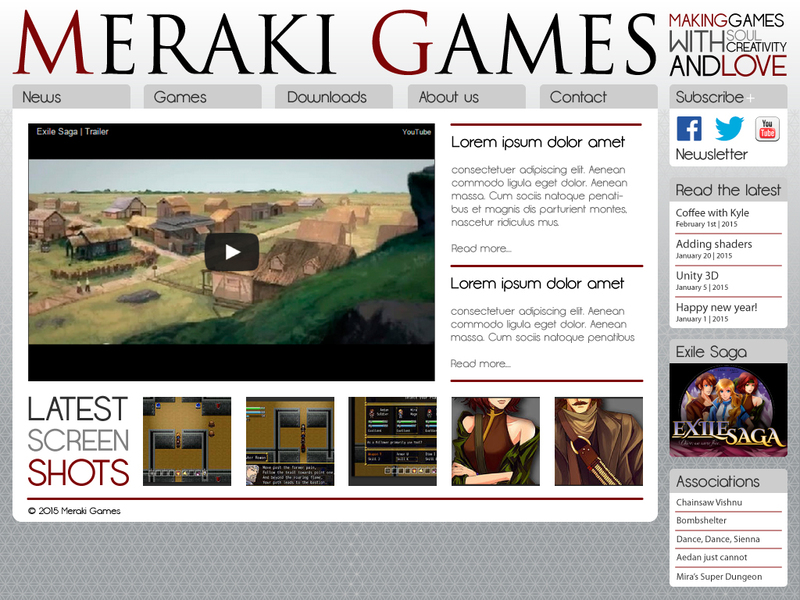 A few weeks ago Kyle asked me to have a look into updating the Exile Saga website and making a brand new one for Meraki Games. We didn’t have one yet, so it was long overdue. Yesterday I finally got around to it and set up merakigames.ca. Definitely an improvement if you ask me, because the old www.exilesaga.com is made with Wix and though Wix has it’s advantages it makes sites heavy, slow to respond and slow to load. Though Wix is a WYSIWYG (What You See Is What You Get) system it can become cumbersome to find your way through the interface when you have an elaborate site and that made it annoying to work with. Plus; the team still depended on me to go into the system to post things which caused delays sometimes. So albeit Wix had many addons it just wasn’t the promised land. As Kyle put it, Wix was inconvenient in case I walked under a bus. From today onwards I can happily walk under any bus I might come across because the new wordpress website allows us to post easier, be far more responsive and (definitely added value) wordpress gives us direct on-the-go data and analytics about performance. Which is excellent because I sure do love my data and though I was already using google analytics; built-in wordpress data is super nice too. In the coming few weeks I’ll be fine-tuning merakigames.ca so if you see any changes; don’t be alarmed. It’s just me fiddling about. In time we plan on going for an entirely custom designed theme too but I’m still working on that; it’s going to need to be absolutely awesome, you see. In meantime, we’ll keep updating you here working with what we have now. Kim signing out, and on her way to find a proper bus. Tah-tah. To fish or not to fish. Because why not fish. Okay maybe a little less fish. 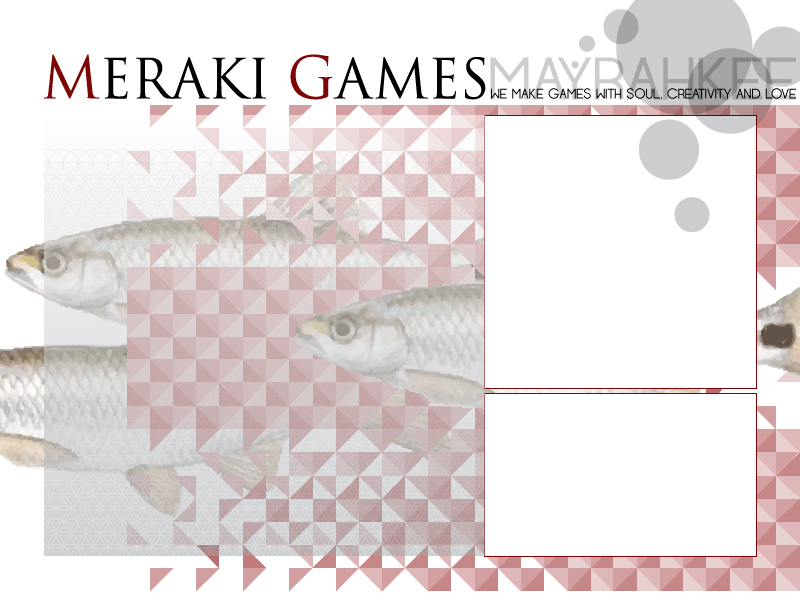 ©2014 Meraki Games Inc. All rights reserved. Pyrrhic Victory, Exile Saga, Meraki Games, and all associated logos and designs are trademarks or registered trademarks of Meraki Games Inc. All other trademarks are the property of their respective owners.